The pea is most commonly the small spherical seed or the seed-pod of the pod fruit Pisum sativum. 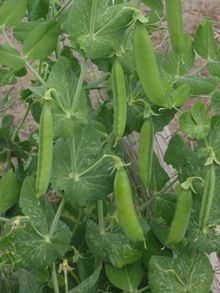 Each pod contains several peas, which can be green or yellow. 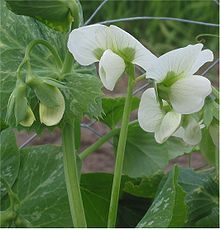 Pea pods are botanically fruit,  since they contain seeds and develop from the ovary of a (pea) flower. The name is also used to describe other edible seeds from the Fabaceae such as the pigeon pea (Cajanus cajan), the cowpea (Vigna unguiculata), and the seeds from several species of Lathyrus. P. sativum is an annual plant, with a life cycle of one year. It is a cool-season crop grown in many parts of the world; planting can take place from winter to early summer depending on location. The average pea weighs between 0.1 and 0.36 gram. 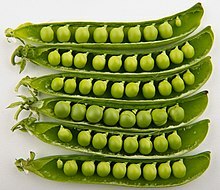 The immature peas (and in snow peas the tender pod as well) are used as a vegetable, fresh, frozen or canned; varieties of the species typically called field peas are grown to produce dry peas like the split pea shelled from the matured pod. These are the basis of pease porridge and pea soup, staples of medieval cuisine; in Europe, consuming fresh immature green peas was an innovation of Early Modern cuisine. Pea soup is eaten in many other parts of the world, including northern Europe, parts of middle Europe, Russia, Iran, Iraq and India. In Sweden it is called ärtsoppa, and is eaten as a traditional Swedish food which predates the Viking age. [ citation needed] This food was made from a fast-growing pea that would mature in a short growing season. Ärtsoppa was especially popular among the poor, who traditionally only had one pot and everything was cooked together for a dinner using a tripod to hold the pot over the fire. In order to freeze and preserve peas, they must first be grown, picked, and shelled. Usually, the more tender the peas are, the more likely that they will be used in the final product. The peas must be put through the process of freezing shortly after being picked so that they do not spoil too soon. Once the peas have been selected, they are placed in ice water and allowed to cool. After, they are sprayed with water to remove any residual dirt or dust that may remain on them. The next step is blanching. The peas are boiled for a few minutes to remove any enzymes that may shorten their shelf life. They are then cooled and removed from the water. The final step is the actual freezing to produce the final product. This step may vary considerably; some companies freeze their peas by air blast freezing, where the vegetables are put through a tunnel at high speeds and frozen by cold air. Finally, the peas are packaged and shipped out for retail. ^ Pownall TL, Udenigwe CC, Aluko RE (2010). "Amino acid composition and antioxidant properties of pea seed ( Pisum sativum L.) enzymatic protein hydrolysate fractions". Journal of Agricultural and Food Chemistry. 58 (8): 4712–4718. doi: 10.1021/jf904456r. PMID 20359226. ^ Slanc; et al. (2009). "Screening of Selected Food and Medicinal Plant Extracts for Pancreatic Lipase Inhibition". Phytotherapy Research. 23 (6): 874–877. doi: 10.1002/ptr.2718. PMID 19107742. ^ Sanchez-Monge, R.; G. Lopez-Torrejon; C. Y. Pascual; J. Varela; M. Martin-Esteban; G. Salcedo (2004). "Vicilin and convicilin are potential major allergens from pea". Clinical & Experimental Allergy. 34 (11): 1747–1753. doi: 10.1111/j.1365-2222.2004.02085.x. ISSN 0954-7894. PMID 15544600.